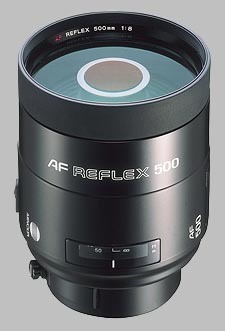 (From Konica Minolta lens literature) The world's first compact and lightweight autofocus reflex-type telephoto lens. A convenient built-in focus-hold button is located on the side of the lens barrel for quick and sure operation. It can also be used on the Maxxum 3000i, 9000, 7000 and 5000 in manual focusing mode (autofocusing and focus indicator will not function). The Konica Minolta 500mm f/8 AF Reflex doesn't have any user reviews yet!